Even teens are getting into M&A. 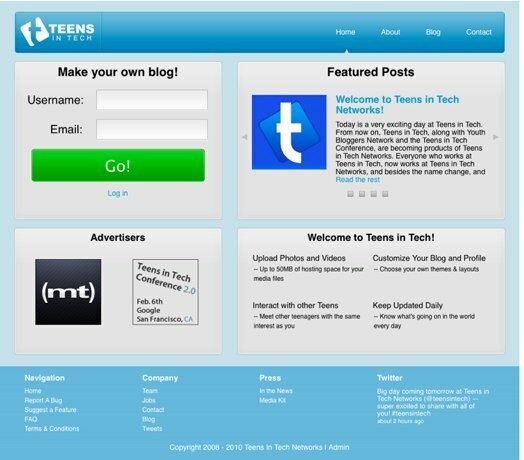 Teens in Tech, a blogging network founded by 17 year old Daniel Brusilovsky, has acquired Yazzem, a Twitter-like microblogging network that allows you to post short thoughts organized by topic to its site, Twitter and FriendFeed simultaneously. Yazzem, which was founded by 14 year olds Zachary Collins and Dustin Snider, was acquired for $15,000. It’s not a huge deal, but these are teenagers, after all. Disclosure: Brusilovsky writes for TechCrunch and he covered Yazzem before buying them. His business relationship with Yazzem’s founders developed after the initial post, which is why we are disclosing it now. Teens in Tech, which currently features content from 700 bloggers, is meant to offer teenagers a simple way to blog their thoughts in an atmosphere that is both safe and receptive to their ideas. Teens can upload audio, video, pictures and text to the platform. The site launched back in August in a private alpha and today is opening up to the public. The site is also launching a new version and redesign later today which will include featured content on its homepage, suggested users and more. The most significant change in the new version of the site is advertising. Bloggers can also collect money from advertising if they choose to turn the ad feature on their blog. Brusilovsky says that the startup is also going to soon roll out premium features, where users will have to pay for more storage, custom CSS and more. Brusilovsky hopes the acquisition of Yazzem represents a way to transform Teens in Tech to more than just a youth-oriented blogging platform in an effort to appeal to a broader demographic than teens. Yazzem’s technology will be become a product of Teens in Tech and its founders will join the teen blogging network. This isn’t the first acquisition for Teens In Tech; the startup snapped up fellow teen blogging site Youth Blogging Network last March. Brusilovsky expects for users to increase more rapidly now that the site is open but it is unclear whether the acquisition of Yazzem will be able to attract older bloggers to Teens in Tech. The network is a laudable effort; especially considering the age of its founder. Teens in Tech even has a conference business. The startup is hosting its second annual Teens in Tech Conference on February 6 at Google’s San Francisco office. Speakers will include Facebook developer Joe Hewitt, Twitter product designer Vitor Lourenço and others.